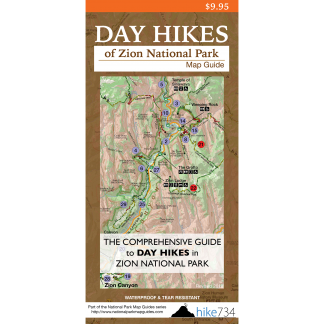 The only trail in Zion that is both bike and pet friendly is the lovely paved path that runs along the Virgin River from the Zion Canyon Visitor Center to the Zion Canyon entrance. This trail makes for an excellent evening stroll as the sun sets and lights up the canyon for classic desert sunsets. The trailhead for the Pa’rus Trail starts right across the vehicular bridge by the Zion Canyon Visitor Center near the Watchman Campground. The trail runs along the northwest edge of the river in the campground, then breaks out into the open areas with panoramic views of the multi-layered mountains surrounding Springdale and the visitor center. The trail crosses the river three times and ends at the Canyon Junction shuttle stop. For a bonus, those on bikes can continue for a quiet bike ride up the canyon all the way to the Temple of Sinawava. Those riding bikes down the Zion Canyon Road must ride single file and stop to let the buses pass. Return the way you came to complete the three mile journey. To save a mile and a half of walking, hop on one of the shuttles to take you back to the Visitor Center. 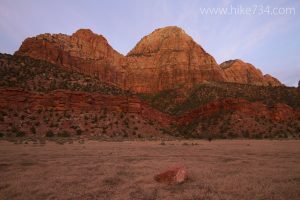 The shuttles can also take you further into Zion Canyon. This level walk is perfect for all ages and abilities and can be done in either direction. Note that pets on leashes are allowed on the trail, but not on the buses. Trailhead: Park at the Zion Canyon Visitor Center and cross the vehicular bridge over the Virgin River. The paved trail starts right after the bridge crossing.